Vladimir Putin looks to revive bilateral relations with Russia’s Caspian neighbour, which soured during the term of Dmitry Medvedev. The proposed visit of Russian President Vladimir Putin to Iran next month has already generated a lot of speculation. Kommersant reported that Putin will visit Iran on August 12. Though official sources have not clearly laid out publicly the details of the visit, speculations are rife that the major items of deliberation will include Iran’s nuclear program, bilateral defence cooperation, and joint pronouncements on regional and international issues. On August 3, Hassan Rouhani will be inaugurated as president of Iran. The new president is perceived to be a moderate politician in national and international spheres, unlike his predecessor Mahmoud Ahmedinejad. 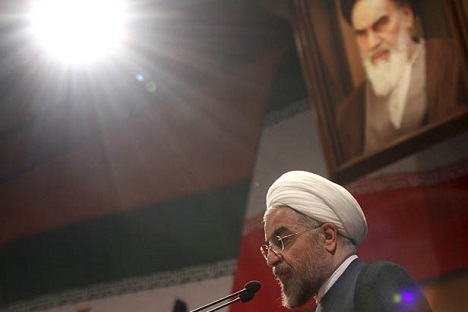 Statements attributed to Rouhani indicate that he is expected to take a moderate approach on Iran’s nuclear program as a trade off to relaxation of international sanctions. As a regional power and ally of Russia, and also as a major energy producer, Iran has been playing a key role in the Middle East politics and the recent conflicts in Syria and other parts of the region too have necessitated a role for the country. Its geopolitical location in the region, and also its proximity to another conflict hot spot Afghanistan, too has poised Iran to play major roles in regional and international politics. Iranian Fars news agency stated that “Putin wants to discuss two important issues which are construction of a new phase for the Bushehr Nuclear Power Plant and replacing S-300 missile system with Antei-2500 missile defence shield delivery.” Among the items of deliberation, Iran’s nuclear program will be certainly one. Iran’s economy has been crippled due to international sanctions, applied on the charge that the Islamic republic is enriching uranium to build nuclear weapons. Iran, on the other hand, has maintained that its uranium enrichment programs are meant to provide fuel to nuclear reactors and for medical purposes. Various international efforts including the last meeting of six powers, Russia, the US, UK, China, France and Germany, and Iran in Kazakhstan in April 2013 to address the Iranian nuclear issue have not worked. During the presidential term of Dmitry Medvedev, Russia took steps to comply with international sanctions and under this compliance had scrapped arms deals with Iran including the deal on S-300 missile system. As a result of which the bilateral relations had soured. The forthcoming visit of President Putin will address this sourness and will provide a boost to bilateral relations. Russia will likely commit to support Iran in developing the Bushehr nuclear power plant. Russia’s support to Iranian nuclear program will create ripples in international politics, and shape the relations among the powers. Syria will likely figure during talks between Putin and Rouhani. Syria has been a bleeding ground for the civilians and a breeding ground for religious extremism. The ruin of the country under international watch has been phenomenal in the past two years, and despite efforts by the United Nations and major powers including Russia the conflict has not subsided. The recent Lavrov-Kerry talks and the proposed peace conference between Assad government and the opposition will hopefully pave the way out of the conflict. Russia and Iran will affirm their commitment to a political solution of the Syrian conflict. As an observer of Shanghai Cooperation Organization, Iran will attend the summit meeting of the organisation in September, the month after Putin’s visit. As the regional politics is whetting up with rapid changes in regional dynamics such as the rise of the Taliban, the withdrawal of the NATO forces from Afghanistan, rise of extremism, terrorism and drug trafficking and transnational organised crime, Iran as part of the regional framework can play along with Russia a significant role in bringing peace, stability and development not only in its territory but also the surrounding regions.